How to trade a top marijuana ETF in North America! We have been experiencing a very wild ride in the marijuana stock market recently. People are comparing this pot mania to a bitcoin spree last year. There is, however, one crucial difference – bitcoin has no intrinsic value. Cannabis carries so many values and human being has discovered maybe only a fraction of them yet. Anyway, the stocks have gone super high again, Tilray going crazy and many others both well-known and less known have also recorded significant price increases on their charts. While everybody is talking about Tilray and their extreme surge in price, I believe that a much more important event has happened yesterday. The HORIZONS MARIJUANA LIFE SCIENCES INDEX ETF broke its long-term resistance and closed at the record. The HMMJ.TO is probably the best marijuana ETF at the moment out there. It is well balanced across 50 various marijuana companies with well-proportioned exposure between them. HMMJ pays dividends – no cannabis firm pays dividends yet, which makes this ETF exceptional. The most of all, the price behaves trendy and very often plays a crucial role in an identification of support and resistance levels. There are 300 marijuana stocks out in Northern America – this is just too much for the industry in a couple of next years. The experts say only 20% are going to be successful. This depends on several important factors like licensing, supply chain, distribution channels, marketing, etc… Thus, it is hard to elaborate all of the elements among 300 companies, especially, with lack of transparency that we are facing in this sector. HMMJ is the best choice for an investor since it eliminates a risk of choosing a loser. Their exposure to stocks is quarterly re-balanced and thus, rising at a nice pace. Below you can see that 5 stocks represent 50% of the marijuana ETF portfolio. It was less half a year ago. Thus, it has been rebalancing well. You can get a complete portfolio from their website, where you would see very small exposures to the tiny companies that may explode later. For instance, Lexaria is also our strong candidate for a future explosion, it has almost doubled since we have reviewed this small cap. 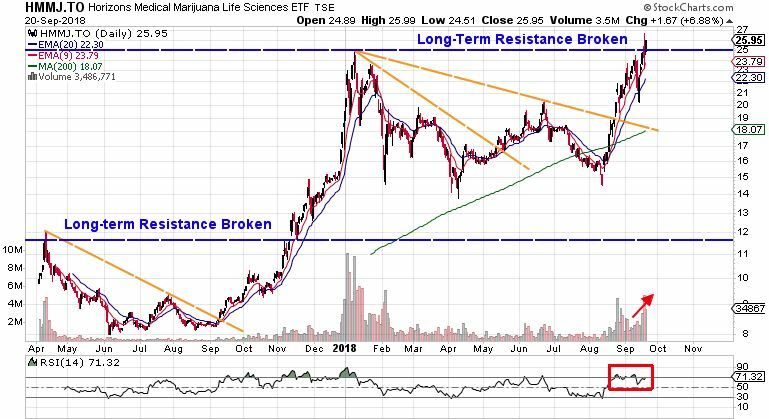 Below chart depicts the entire life of the HORIZONS MARIJUANA LIFE SCIENCES INDEX ETF, where medium-term resistance levels are demonstrated by orange lines and long-term resistance levels are demonstrated by blue lines. Every time the stock broke the resistance, a price followed an upward swing. At the moment, the price recorded its highest high and additionally, it has closed above the long-term resistance. The price increases have been accompanied by higher volumes which signify strong interest in the industry. The RSI has been sliding an edge of overbought level in an alternate manner and ADX is at 40, which is a proof of a super-strong trend. These are important technical elements that push the price of the marijuana ETF higher. The good stocks such as Aurora or Canopy have been enjoying a good and reasonable ride in upward direction recently. Thus, it is likely that the bulk of the good quality stocks will need some consolidation before going even higher. Above chart depicts also the support levels that have worked very well in the past. As you can see, when the price is riding its trend higher, it always climbs the 9 period Exponential Moving Average (EMA) and consolidates toward 20 EMA. A break down from 20 EMA would mean further consolidation as we saw in the first half of 2018. 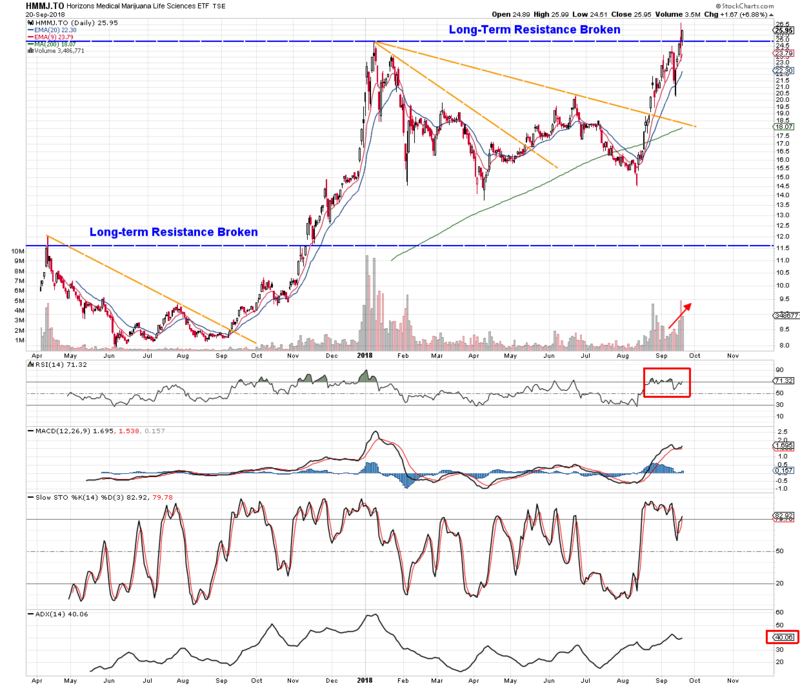 Last year in November, the ETF has broken the long-term resistance for a first time, which was followed by the extreme rise in price in a short period of time. This time, we are experiencing a very similar situation in a very similar time and market condition. The very different is a level of market participants. There are much more people, institutional investors and other companies such as Constellation Brands or Coca-Cola engaging into the cannabis sector. The fact that October 17 – the start of cannabis sales in Canada could be already priced in. Or not? I’m not saying this marijuana ETF is going to double again within 2 months because it happened last time such resistance was broken because history does not repeat. I’m saying investing in marijuana is the best investment at the moment because we are at the beginning of completely new finally legal business era that will be only rising in long-term. Thus, history is going to rhyme! How much is it going to rhyme? Let’s just see how this song is going to revolve! If you wish to stay informed, simply subscribe to our future posts entering your e-mail in a right sidebar.